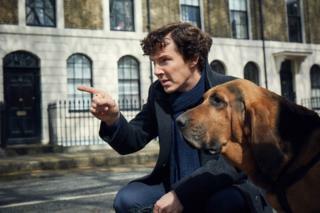 Sherlock star Benedict Cumberbatch has been photographed consulting a canine companion in the first photo released from the BBC drama's new series. The first-look image comes hot on the tail of the 39-year-old star being nominated for an Emmy award for Sherlock's Abominable Bride special. Cumberbatch is currently shooting the fourth series of the BBC's updated take on Sir Arthur Conan Doyle's detective. Earlier this week he and co-star Martin Freeman were seen filming in Cardiff. It was announced in May Harry Potter actor Toby Jones would play a villain in the second episode of the new three-part series. In the Sherlock Holmes books by Sir Arthur, a dog called Toby accompanies the sleuth in some of the stories. Sherlock is due back on screens in the new year. Follow us on Twitter @BBCNewsEnts, on Instagram at bbcnewsents, or email entertainment.news@bbc.co.uk.